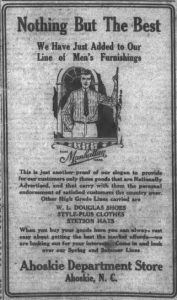 An advertisement for Ahoskie Department Store in the March 9, 1923 issue. The Hertford County Herald, courtesy of Chowan University, is the newest paper available on DigitalNC, with issues up that span the years 1914-1923. The Hertford County Herald was established in 1910, and was published in the town of Ahoskie, North Carolina. The paper, which came out every Friday, was comprised of 8 dense pages to keep residents of Hertford County informed. The Hertford County Herald covered news primarily in Ahokie and surrounding towns in Hertford County, such as Winton, Murfreesboro, and Como. Included were stories about the economy, agricultural conditions, politics, social events and meetings, fashion trends, and more. 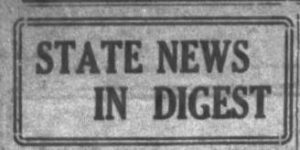 The paper also had a section called “State News in Digest” that covered a wide range of news from across North Carolina, and advertisements from local and regional businesses. To see more materials from Chowan University, visit their DigitalNC partner page, or take a look at their website.